The capital of Lebanon - Beirut, is beautifully situated on the Mediterranean coast. While historical are to reserve a hard fate of Beirut, the Lebanese capital today is a remarkable place that shines with modern new buildings. In many buildings there are the offices of most major international companies. The neighborhood of Beirut, known as Raouché, is commercial but it is also a residential area of town. There are many buildings with posh residential apartments and numerous restaurants which lay attractive on both sides of the rocky coast. In this part of Beirut is a wide promenade from which visitors and residents of the Lebanese capital have the opportunity to enjoy the only landmark of Beirut – Pigeon’s Rock. Pigeon's Rock is also known as Rock of Raouché. It is the unchanging natural picture that stands on the business card of Beirut. Located in the most western part of the capital, Pigeon’s Rock is a popular landmark not only for Lebanese but also for nature lovers from around the world. Locally these two risings from the waters of the sea cliffs are known as Burj al-Hamam. They are number one among the natural attractions of Beirut mostly because of their wondrous natural beauty and relaxed atmosphere. Views from the coastline is something that one could contemplate for hours. 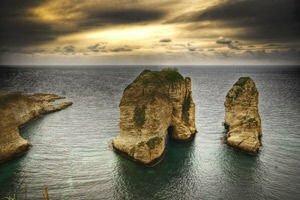 By their nature, the natural phenomenon is representing two limestone rock formations - one being bigger than the other, which are located close to the coast of Beirut. In this part of the Lebanese capital, researchers have found the oldest archaeological evidence of the population of the local Lebanese territory. The Pigeon’s Rock is a favorite spot for locals who use the coastline for jogging or pleasant walks along the sea coast. Tourists in the city have the opportunity to relax in one of the coastal restaurants or cafes, while admiring the inspiring panorama of Pigeon’s Rock at sunset whilst having the opportunity to try some of the specialties of the exotic Lebanese cuisine. The natural beauty of Pigeon’s Rock is emphasized most in the evening and early morning when the sun rises and the rays are reflected in a unique way on the uneven surface of the massive limestones. The best place to monitor the natural phenomenon is in the place where the neighborhood ends and begins, Manara Raouché. Pigeon’s Rock pigeon in Beirut is only accessible by boat.